This Masjid has good architecture with Arab influence. Its a big place for prayer. We went there at noon. At that time not much people over there, so we had a nice time near the masjid, took some photographs and had a prayer. Walk past the masjid jamek LRT (train station), starts the shops…cheap/fake watches, bags, kids stuff, slippers, dress material…what not! Mostly petty shops run by malay people..some are very interesting…you happen to get the latest toys or dress here…you can see most of the shops selling the famous traditional malay dresses too! You come behind the LRT and then starts all indian shops – eateries, jewellery, dress and multi purpose general stores. The Mydin and Hanifa stores are must stop for chocolates and electronics purchase. Sarvana bhavan and malay food court fish dishes need a mention. Coliseum theatre plays south indian films. Lotus and Citin hotels got good reviews and are worth staying. You may cross the masjid india once you hit jalan tuanku abdul rahman at the coliseum theatre and SOGO shopping mall. Note : Avoid friday afternoons as it will be prayer time and overcrowded. If not closed, it’s definitely worth a visit. Non-muslim will be given a proper dress if needed. The mosque is more than 100 years old. Interesting to visit for a foreigner, especially for the view of dozens of people laying on the floor in the mosque surrounded by the high buildings. Nice architecture, especially minarets. One of the oldest Masjid of Kuala Lumpur for muslim praying area. Word Jamek is derived from Arabic (Jameh) which is used to charecterize those masjids where Juma congregation and prayers are being regularly organized . This is just in the heart of Kuala Lumpur and the moment you get out from Masjid Jamek LRT station you will find across the Jalan Perak.It is located at the confluence of the Klang and Gombak River and was designed by Arthur Benison Hubback and open for public in 1909. Non muslims are also allowed to visit and see the historical building. Visiting women must dress in a manner respecting islamic value and cover their feet and head. The beauty and structral style of this building are really quite ordinary compare to other Masjids of other part of muslim world and even other Masjids of Malaysia. Though, it’s a holy religious place but I find it rather disappointing structure or probably I have seen many much beautiful masjids in my life. Inside of masjid is far more simpler to make this masjid historical. Anyways, since the masjid is just in the center of the town, do not miss the opportunity to go and take few pictures. Located at the confluence of Klang & Gombak Rivers, this mosque (‘masjid’ in Malay) is one of the oldest monuments in Kuala Lumpur. It is half way between Central Market and Merdeka Square. The architecture is part of the Indian Moghul style imported by the British. It is a definite landmark in KL. 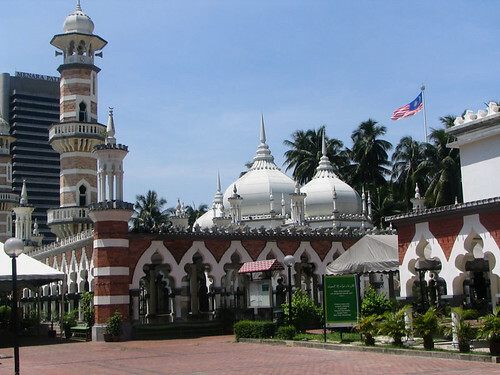 Masjid Jamek is located at the confluence of the Klang and Gombak river, the site where Kuala Lumpur was founded. It is considered one of the oldest mosques in the country as it has over 100 years of history since it was built in 1909 by architect A.B Hubbock. The same architect was also responsible for designing the country’s many colonial buildings. 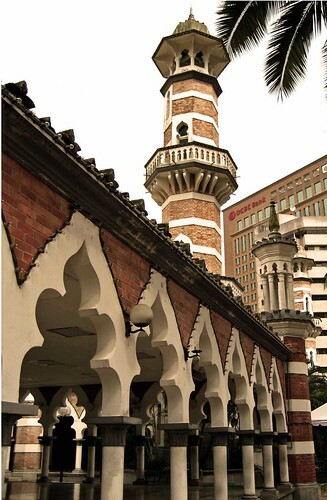 Known as the Friday Mosque, Masjid Jamek is well-known for its unique Mughal architecture which consists of three large onion-shaped domes, two minarets and arched colonnades. 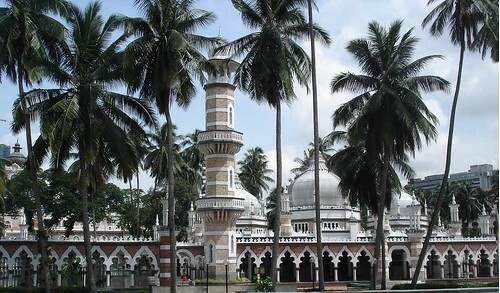 Moreover, the mosque surrounding area is beautifully decorated by palm groves. Coupled by its strategic location which possesses unrivaled views of the city, the mosque forms a tranquil haven in the middle of the city. There are a total of three domes surrounding the prayer hall. The central dome is as high as 70 ft and is defined by two other lower domes and there are two high minarets in red and white stripes at the corners which measured around 88 ft tall. The mosque is always packed with devotees and also tourists. This is definitely a must visit place to appreciate the ancient architecture with a combination design of different cultures. It may not be something special to Muslims but for all other religions, this is indeed a place worth a visit. The mosque is open to visitors except its main prayer hall which only Muslim are allowed to enter. Visitors to the mosque must be dressed appropriately with arms and legs covered and women must cover their hands. Gowns are supplied free of charge and shoes must be taken off before entering.